Well, this weekend has been a bit of a mind-trip so far. I've taken in the 1972 filmed version of Alice's Adventures in Wonderland, the graphic novel adaption of the 2010 Alice in Wonderland movie, Mahendra Singh's illustrated version of The Hunting of the Snark, several philosophical essays by Steve Ditko, and Sean Andress's first two issues of Moral Geometry. Having absorbed all that in the past day or two, you'll excuse me if I'm not entirely coherent with this post. When Andress first contacted me about his comics, he likened them to "a violent car crash between a Terry Gilliam film and sleazy German Expressionistic art." When I got them and flipped through them initially, it was pretty obvious that I wasn't going to "get" these books right away. That was about two weeks ago, I don't think I'm any closer to understanding them now than I was then. The stories are mostly wordless, and rely primarily on Andress' brushwork. (Despite the covers, the interiors do not feature any collages.) As suggested by his original description, the illustrations themselves are fairly impressionistic -- you can make out characters AS characters but, for the most part, they make the cast of Tod Browning's Freaks seem ordinary. With the exception of perhaps the first few pages of the first book, Andress is able to make the panel-to-panel and page-to-page transitions smooth, so the reader can focus on what's actually going on, rather than trying to decipher the flow. Which, I think, is critical here. The pieces aren't easy to really grasp here beyond a superficial level. It's easy enough to see what is going on, but much more difficult to figure out why. Because of that, I'm more inclined to take his later description of "a violent car crash between a David Lynch film and sleazy German Expressionistic art." Overall, I'm going to have to go back and borrow a line from Lewis Carroll's Through the Looking-Glass... "Somehow it seems to fill my head with ideas---only I don't exactly know what they are! However, somebody killed something: that's clear, at any rate." 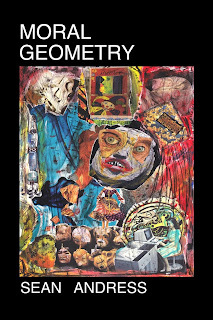 Andress has begun posting pages at a new Moral Geometry blog while printed copies can be purchased from his broader art blog.